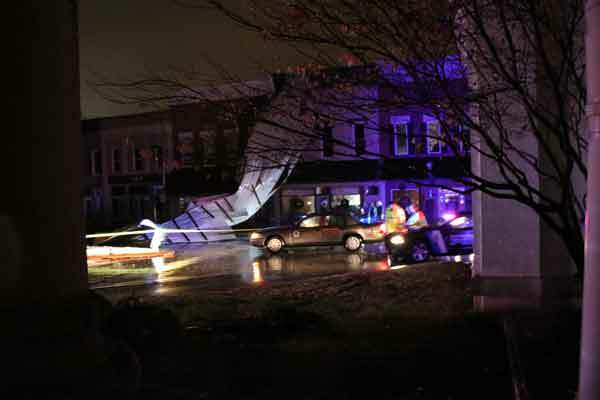 Columbia Police Department officers were on the scene at the public square just after 11 p.m. Saturday night after a storm swept through downtown. The roof on Harris and Harris law firm, 204 Public Sq., was blown off and was thrown onto the square. Officers quickly cleared debris so traffic could resume. The parking area is roped off but vehicles can travel the area. Officers and members of Search and Rescue drove through town to search for other damage. As the storm came through, one officer saw transformers being blown. Tree limbs and debris were reported in some areas. As of 12:30 a.m., electricity was still off for buildings on the square and some areas around the square. KU workers were in the area working to make repairs at that time.